Instructions tested with a Raspberry Pi 2 with an 8GB memory card. Probably also works fine on a Raspberry Pi 3. Download the latest Raspbian Jessie Light image. Earlier versions of Raspbian won't work. Write it to a memory card using Etcher, put the memory card in the RPi and boot it up. Log in. Default username / password is pi / raspberry. Set up Wifi (if you are using Wifi) according to the Raspberry Pi instructions. Configure gpu memory split under 'Advanced'. Set it up '16'. sudo python3 setup.py install --compiler-flags "-mfpu=neon"
If you are installing PIXEL, you should probably up your memory split to 64. 16 will not give much responsiveness. @samiturki The error is quite clear, no? I'd love to know if there's a good way to speed this up, too. Thanks, @vchatterji but can you explain a little more about how to use along with face_recognition examples? how would one add biden.jpg (which is already there) as the 'match' in the example? is there any way to send an output signal to one of the gpio pins on raspberrypi3 when there is a match in a picture? It's working fine on a RPi 3. I tested it successfully following the instructions above. But it's quite slow to output the result on a RPi3, compared with the one in a VM on an Intel i5 PC. So I am not sure if I can use the picamera to trace the face real-timely. urllib3.exceptions.ReadTimeoutError: HTTPSConnectionPool(host='pypi.python.org', port=443): Read timed out. When I try running sudo python3 setup.py install --compiler-flags "-mpfu=neon", I get this error: error: option --compiler-flags not recognized, I also find no mention of this option in the setup.py file? has anyone got this to work on windows ? It took me ~20 min, because I have a bad internet connection. And the face_recognition lib works fine. Can anyone share some benchmarks like what FPS are they able to achieve with this? And on what resolution? The "mpfu" error is because it's a typo. It should be -mfpu=neon. F before p.
It'll compile without any problems then, but I haven't really noticed any performance boost. Can it run at Raspberry Pi model B+? Would dlib benefit from VFPV3 optimization in addition to NEON? Wondering if it can work with an USB camera ? Yes, it is working with usb Camera on the PI 3. I currently use a logitech c920 and it is working. But even reducing image resolution to 320x240, the performance is bad : the face detection is 3s / frame and 1.2 to compute encodings. So it is more than 4s per frame. Anyone managed better performance ? using the PI 3 gpu ? I was running this code with a USB webcam and got an error. Are you using it for real-time the same way like I do ? Thank you! I‘ve solved this problem successfully! Appreciate any help! Thank you! how to install it for python 2.7 in raspberry pi 3-B? Hi! When I try to run python3 ./face_recognition/examples/facerec_on_raspberry_pi.py I get exception occurred. how to fix it? I ran sudo apt-get clean and git clean -xdf it didn't help. I searched for errors related to libf77blas.so.3 - found one reference to installing another library.. I ran sudo apt-get install libatlas-base-dev and this fixed the "Original error was: libf77blas.so.3: cannot open shared object file: No such file or directory" error. @EnglishAlex Thank you.I run sudo apt-get install libatlas but it didn't help.When i run sudo apt-get install libatlas-base-dev.I‘ve solved this problem successfully. Then there is dlib. This tutorial uses 19.6 in the example codes, but the setup.py requirements say >= 19.7. This means your freshly installed dlib is instantly removed. Yes, I know. It took very long for me too. The first command you should change 19.6 to 19.9. I hope this helped any of you, I know it sure did help me. Thank you, It helped, I sucessfully installed face_recognition on raspbian lite. With "python3.6 -m pip ...". I installed both dlib and face_recognition with pip. It takes a lot of time around 2-3 hours for all modules[dlib,scipy,numpy,pillow,click,face_recognition. fortunately,I fix it after i ran " sudo apt-get install libatlas-base-dev "
Is this normal and should be expected? ``sudo python3 setup.py install --compiler-flags "-mfpu=neon"
It take from 4 to 6 hour to finish and when it reach 98 % it stopped with error ? is there any second choose ? Been about 16 hours, on 96% on a RPi Zero W... Waiting, this is my 5th attempt. since 1024 would just error "ran out of memory" at around 40%. Probably because the Zero has only 512mb of ram. Will update if it works this time. I've already ordered a Pi3 B+, looking forward to that one if this does not work. Update: build failed at 96%, ran out of memory. Tried again, make sure GPU memory split is set to 16, not 64"
Got it working, has to reinstall numpy afterward since I was getting this error. It now works. The Pi Zero is as slow as advertised. The "find_faces_in_picture.py" takes about 60 seconds. Looking at ways to optimize while my Pi 3 B+ arrives. For those looking to improve performance you need to install OpenBlas before compiling dlib. It does make things a bit faster if you do. As I found out painfully, OpenBLAS does help, but it will chew up your cores and cause days of head banging if you don't set the following environment variables in your shell before running any recognition. fatal: unable to access 'https://github.com/davisking/dlib.git/': GnuTLS recv error (-54): Error in the pull function. Help!! Face_Recognition does not download successfully on my pi 3b. It downloads half way then spits out some errors in red that are too large to paste here. I have dlib installed already. Anyone encountered the same problem downloading the api? Hi,guys.when I run python3 facerec_on_raspberry_pi.py , I get exception occurred. how to fix it? RuntimeError: The full_object_detection must use the iBUG 300W 68 point face landmark style. And Everything compiled the way it was supposed to. Tested the face_recognition.face_locations function and it took, on average, 0.7 seconds. But the face_recognition.face_encodings function runs forever(I waited 20 minutes before rebooting). I tried changing the memory split, but it didn't work. 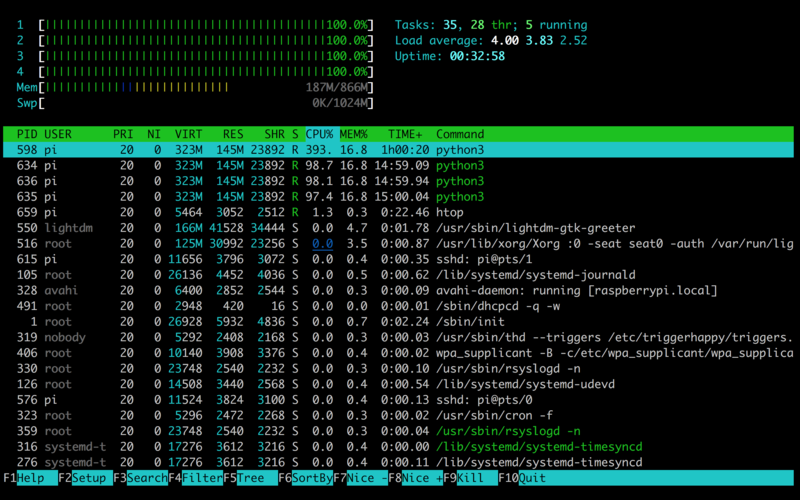 And this entire time, all 4 cores of the raspberry are working 100%. Don't know what that might be, I'm going to try to reinstall everything and see if I made any mistakes on the way. Long story short, this guy had the same problem and provided a fix (davisking/dlib#660). how to install cv2 in raspberry pi 3 ? Could you please kindly advise. When I installing dlib, I found that it's unnecesary to change the size of swapfile. During the installation, the max usage of swap is less than 10MB. So the default settings(100MB) is OK.
My model is Raspberry Pi 2B, 1G RAM. By the way, I change the GPU memory to 8MB, it still runs well. Is this instruction for camera connected through CSI or usb too? Thanks to Yumi Lee, this has fully addressed the issue. I have installed every required library and no such error or warning was encountered by the time but when i run the code, it showed some error. I have this running on a Pi Zero W with the Pi ZeroCam. It's not fast but it does work well. If you want to test a complete install the blog links to an img file with everything installed that you can flash to a microSD card with Etcher. Can anyone please guide me on how to solve this? Careful installation of PIXEL GUI, the result is often stuck, you need to format the TF card, and then you need to re-install. After the installation is completed step by step, the prompt is: “picamera.exc.piCameraError: camera is not enabled. ” but through sudo raspi-confgi, the camera has been enabled , and detect support = 1, dectected = 0, where is the problem? On which Pi does this performs better? And how much memory it should have? I tried to update lib6 with sudo apt-get install libc6 and recompile but the error is still there. Face_Recognition does not download successfully on my pi 3b. It downloads half way then spits out some errors in red. I have dlib installed already. Any suggestions ,please?